Accommodation options to suit all our guests. The station lies 36 kilometres from the magnificent Kings Canyon (Watarrka) and is set amongst majestic desert oaks. 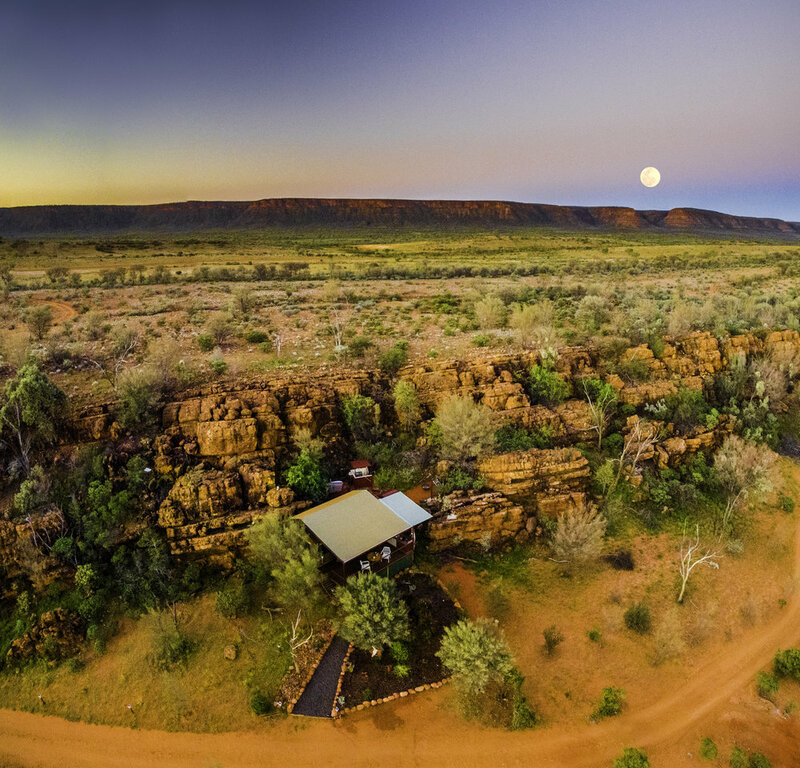 Kings Creek Station is a working cattle/camel station that offers visitors a wide range of accommodation from self camping, safari tents, a bush swag camp, and the Dreamtime Escarpment glamping. Basic supplies, meals and drinks can be bought at the station shop, and our camel burgers are a huge favourite with many visitors. The station is an exporter of wild camels in Australia and sells camels for live export, live domestic sales and meat. Some 36 documentaries have been filmed at Kings Creek and the station hosted Australian Geographics' fourth expedition. In 2001 the world famous Australian Safari travelled through and stayed at the station. Kings Creek Station has also been featured on 7 Sunrise Weather hosted by Grant Denyer in 2012. Set amongst natural bush with views of the George Gill Range, our campground offers a choice of grassed and un-grassed sites, with or without power. Toilet, shower and laundry facilities are provided; and don't forget the swimming pool! Our spacious campground provides various sized sites catering for tents, caravans, campervans and swags. Native trees provide shade and privacy giving an air of peace and tranquility. Child 5 and under free of charge. Prices include GST. MasterCard, Bank Card, VISA and EFTPOS welcome. Seniors Card holder discount applies. Kings Creek Safari Cabins are permanent canvas cabins constructed of steel frames, tiled floors and lockable doors. Featuring light and power the cabins are twin share with all linen provided. There are shared toilet and shower facilities, kitchen, grassed picnic area and swimming pool. The kitchen provides tea & coffee making facilities, microwave, fridge and gas BBQ; perfect if you want to prepare your own meal! Alternatively order from our extensive menu, which caters for all budgets and tastes. BBQ packs are available at the shop along with bottled wine and beer. Just remember that the kitchen takes last meal orders at 6.30pm. Cabins are provided on a bed and breakfast basis. The Bushman's style breakfast consists of: bacon & eggs, sausages, baked beans, tomatoes, toast, cereals, tea & coffee. $108.00 per adult per night (2 adults, twin share). $63.00 per child per night (6-16 years). $34.00 per swag hire (child use only 10 or under). These prices include a cooked bushmans breakfast. Child 5 and under free of charge. Seniors Card holder discount applies. Our luxury secluded glamping tents are positioned along the escarpment and elevated to provide maximum airflow and views. These spacious and beautifully appointed tents allow you to really experience iconic Australian camping on a truly genuine but luxurious level. The focus is on comfort with quality linens and décor, king-size or twin beds, a private bathroom with a difference, luxury amenities, bathrobe and slippers, power, heating, air-conditioning and coffee machine. Lounge in the pool or on the deck with the vast desert as your back drop and keep an eye out for wildlife that may wander into view. Stargaze the desert skies or toast marshmallows by your private fire. The self-cook bush inspired BBQ dinner and breakfast hamper will be provided with all the trimmings to create a memorable outback dining experience. Enjoy the selection of drinks to complement your meals. $1385, includes 1 night luxury accommodation, cheese platter, 2 course self cook BBQ dinner, drinks package and a self cook breakfast hamper. Prices effective 1st April 2018 to 31st March 2019. We also can arrange a variety of optional extras to make your stay with us even more unforgettable. Quad bike experiences, cultural tours, helicopter flights, hosted dinners and picnic lunches. Please note, the Dreamtime Escarpment is for guests aged 18 and over. To secure your booking, we do require a deposit of $500 (plus 1.5% credit card surcharge) per luxury tented cabin. To book, click on the 'BOOK NOW' button. **Please note if we do not receive a Credit Card payment 1 week prior to your arrival, your booking maybe cancelled. **Cancellation Policy. $500 deposit per cabin is required to confirm all reservations. We require 24hrs notice of cancellation otherwise 100% of deposit will be forfeited. Can be subject to management discretion e.g; extreme weather conditions if policy is enforced.Seniors Card holder discount applies. The Old Drovers Camp features accommodation for up to 12 guests. Sleep in a classic but ultra comfortable, elevated Australian swag under the stars, with fantastic views of the nearby George Gill Ranges. Enjoy a evening meal prepared by the cook in the large dining area and the following morning you will head on to Kings Creek Station for a Bushmans style, fully cooked breakfast. This will be all inclusive in your stay. The camp features a large dining area with full kitchen set up. While in the dining area you can discover the history about the local Aboriginal drover or hero that each ‘outdoor bedroom’ is named after. 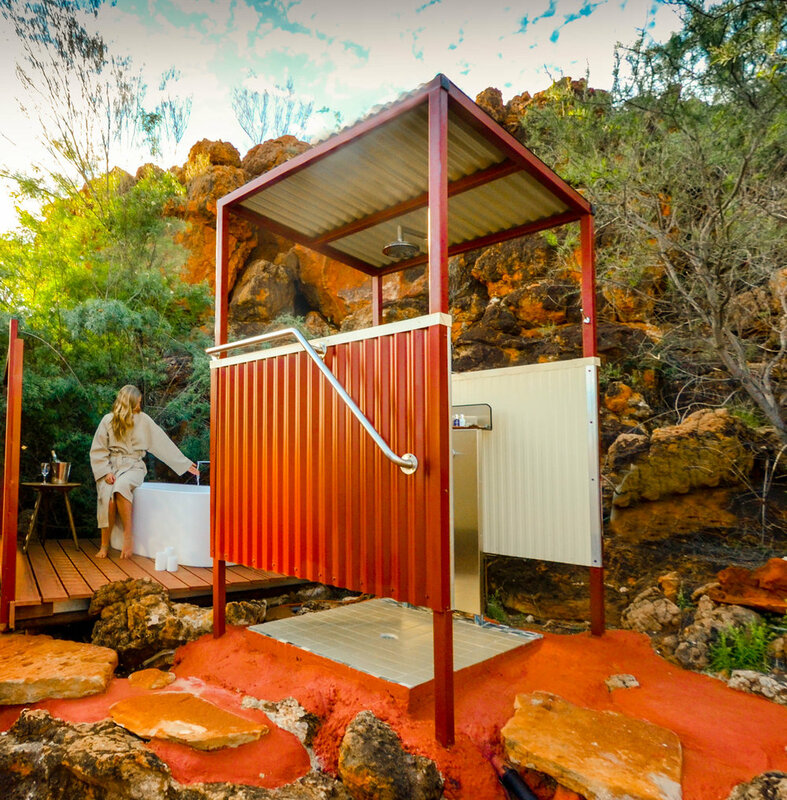 The camp has 3 toilets and 2 hot showers for the exclusive use of The Old Drovers Camp. Guests will have the opportunity to visit Kings Creek Station and add on a quad bike tour of the station and/or a scenic helicopter flight. 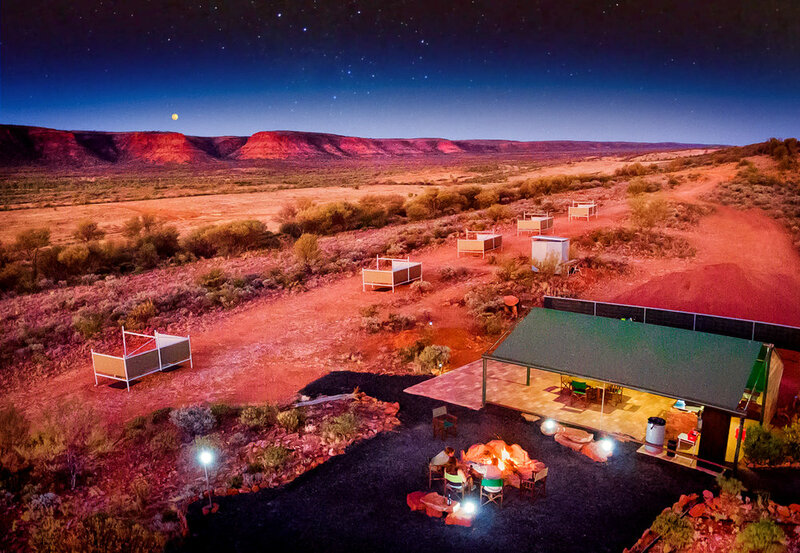 Packages from $341per person, includes 1 night accommodation, sunset drink, hosted cooked BBQ dinner and cooked breakfast. We also can arrange a variety of optional extras to make your stay with us even more unforgettable. Quad bike experiences, cultural tours, helicopter flights, and picnic lunches. We require 24hrs notice of cancellation otherwise 100% of deposit will be forfeited. Can be subject to management discretion e.g; extreme weather conditions if policy is enforced. Seniors Card holder discount applies.